Design and Inspirations: How Do I Fix Broken Clawfoot Tub Feet? How Do I Fix Broken Clawfoot Tub Feet? We recently had a man put tile down on our bathroom floor. He had to remove the claw foot tub from the bathroom in order to complete the task. In order for him to remove the tub, he had to take two off the back legs. When he finished tiling out the floor and put the tub back we found out one of the legs was not secure and there was a big boom. The pipes broke in half and water was coming from the bathroom, through our dining room ceiling, ruining an already old but functioning chandelier. We called him and had him come back to see what went wrong. He tried soldering it back onto the bottom, but that didn’t work and the other back leg fell off too. So now we have tiles and bricks trying to hold up the tub. We would like to know if there is a company near Philadelphia that can fix this type of tub. It’s a shame to have to get rid of it, which is what we are thinking of doing. What do you suggest? We were told by someone that a tub like ours could cost a few thousand dollars because it’s antique, and I guess it's cast iron. Help! I look forward to your response. Here is what I would do. First, do not try to reattach broken feet to a tub. They just don’t work. We don’t suggest welding the feet back on as the intense heat of this processes can damage the porcelain interior of the tub. 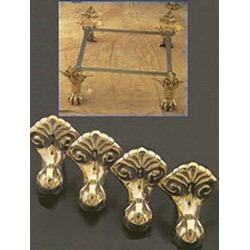 You can try to find an antique foot that matches your foot, but that that might be a chore as there are over 450 different styles of antique tub feet. Next, you could try to have a foot cast to match your tub. Again, this is a bit tricky because the front legs of many tubs are a slightly different length than the rear legs so you need a rear foot to make the copy. Unfortunately, it sounds like the other rear foot was damaged as well. I would suggest you replace all four feet with a new cradle and foot set from Strom Plumbing. We've had good luck with these feet. Alternatively, you could get rid of your tub and replace it with a new one. I would not recommend this unless your current tub is in need of refinishing or you were planning on replacing it anyway. I have no idea what your tub is worth, but unless it is a truly rare piece, it will only be worth $50 - $500 depending on condition. The two broken feet in the back will drop the tub value quite a bit. All you have to do is put a nail between the clawfoot leg and the tub body. This is what the men who originally installed these clawfoot tubs did back in the turn of the century. This is how to keep the legs on. Apparently when the tile guys removed your tub...the pins (nails) fell out of the leg. Mine have finishing nails stuck in the legs. About 2 inches long. Whatever size fits the empty gap space between the leg and the body of the clawfoot tub. I have a similar issue. We bought a refinished clawfoot tub. The feet slide into groove type slots in the bottom of the tub. My husband filled the tub with water and the feet must have slid apart because the tub fell to the floor. Any ideas on what went wrong? It doesn't appear that there is any means of bolting the feet in place. No other hardware came with the tub.